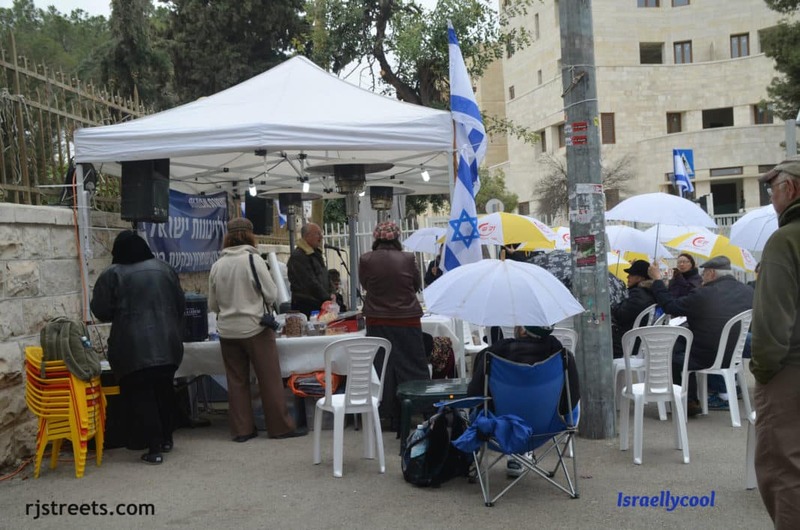 For 935 days, the Shalit family had a protest tent on the street corner near the Prime Minister’s residence in Jerusalem, Israel, demanding the release of their son Gilad. Since that time, many protests and demonstrations have come and gone. 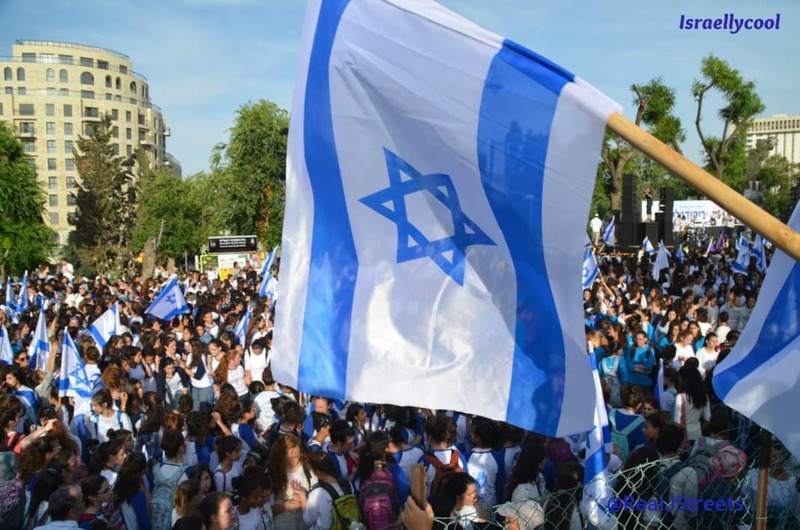 The Mothers say YES to Israeli Sovereignty. “We came to strengthen not to demonstrate. We came to let our voices be heard and not to protest against the prime minister, who certainly is worried about the security of the country and its citizens,” said organizers Yehudit Katsover and Nadia Matar of Women in Green. 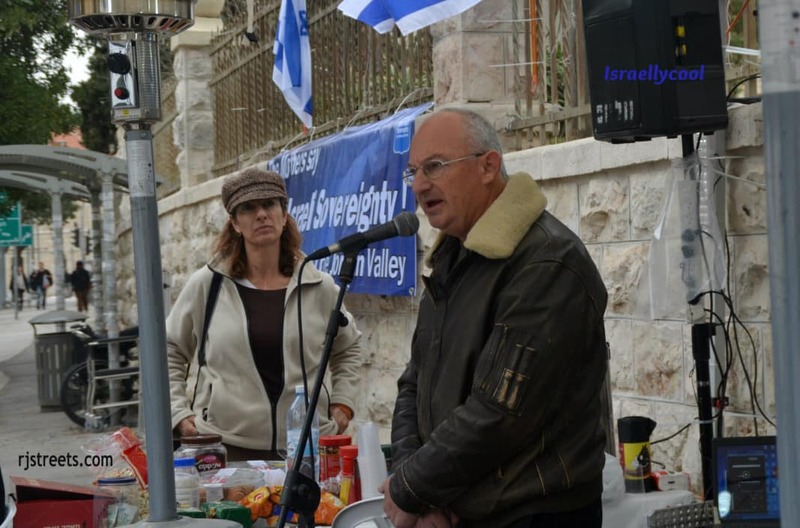 Former MK Prof. Arieh Eldad, of Professors for a Strong Israel assisted in arranging the event and was one of first speakers. 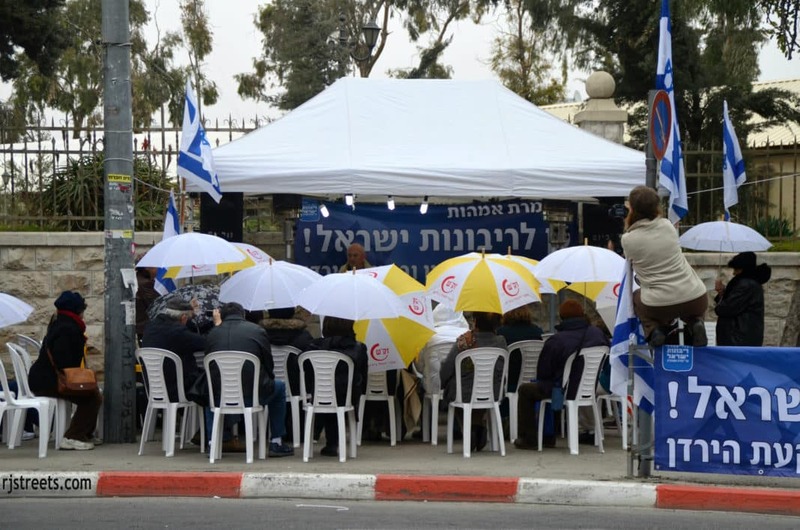 As people sat the first rainy day under umbrellas, Nadia Matar was determined to get a good photo while Eldad was speaking, even if it meant hanging from a pole. Interesting when women want to be heard, they provide guest speakers, chairs and umbrellas, generators and heat, light and lots of cookies and drinks. But then again this was not a demonstration or protest. “We’re tired of retreats and concessions. We’re tired of the eternal lie of the left that claims the establishment of a Palestinian state in spitting distance of the Ben Gurion Airport will bring peace,” argued the activists. The vigil is to run from 9 a.m. to 9 p.m. until Sunday, February 9.